Beautiful single rose for Mom. 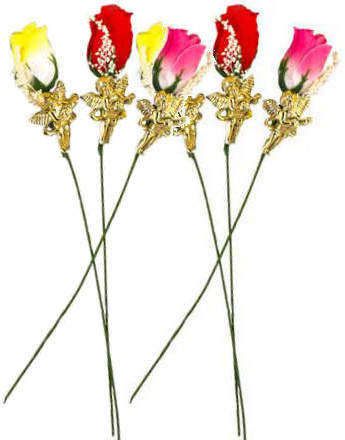 Red, yellow or pink assorted 7 inch tall cloth adorned rose with angel. Perfect for that Mother's Day, church gift, special Day outing, birthdays, hospital visit or just because she's loved. Attached Guardian Angel plastic gold charm. Valentines day gifts Individually clear wrapped. For Mothers Day, spray perfume on each rose for a extra love, Also Christmas. Sold in an assortment of pink, yellow or red per rose. The wilderness and the solitary place shall be glad for them; and the desert shall rejoice, and blossom as the rose. Isaiah Chapter 35.